Last year, we introduced a new family tradition, as suggested by Andrea over at a peek inside the fishbowl. She provided the templates and ideas for a family advent calendar and it was such a fantastic experience. We did a special family activity every day leading up to Christmas, and it really made December feel special. As well, it gave the kids something to do every day, so there was less of the “WHEN WILL CHRISTMAS BE HERE??? ?” hysteria. A good thing. 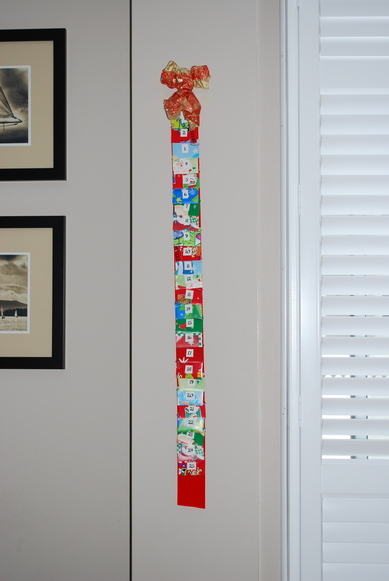 Here’s a picture of our advent calendar from last year — it’s a set of tiny envelopes (made from leftover scraps of wrapping paper) clipped to a thick strip of ribbon and taped to the wall. We open one envelope per day, and each one has a little slip of paper inside with the day’s activity on it. This year will be a little harder since the Captain is in school all day, leaving us less time in the afternoon to play. I’m still really looking forward to it, though — it’s going to be so much fun! Here is my activity list for this year. 1. Hang up the stockings. 2. Put up the tree. 3. Make rice krispie squares. 4. Visit the LEGO exhibit at the Science Museum. 5. Wrap presents for your brother and sisters. 7. Build a fort in the front room. 8. Have a bubble bath in the big tub. 12. Visit Santa and take a toy to Toy Mountain. 14. Make a book about Christmas. Or Star Wars. 17. Glue pictures of toys to make a mural. 18. Make a silly crown and have a parade. 19. Get dressed up for dinner – we’re having take out! 21. Make a giant floor painting. 22. Build a train track all around the Christmas tree. 23. Go for a drive in your PJs to look at Christmas lights. 24. Bake cookies for Santa. And here are some alternate activities — last year a few of our planned activities fell through due to illness or lack of snow or missing baking ingredients, so it was good to have a few extra activities in case I needed to make a last minute swap. Go to the library and read books about Christmas. Make puppets from paper bags or popsicle sticks and perform a show. Go to the video store and rent one movie each. Play a board game and do puzzles with Mommy and Daddy. I hope you’ll join in — we had such a great time last year that I definitely plan on doing this every year from now on. Awesome! I loved this idea at Andrea’s place and I love the ideas you’ve compiled! #14 made me laugh — do you remember that wretched Star Wars Christmas special, circa 1978 or so? A high in lows, even for an inveterate SW fan like me! P.S. Christmas movies? The best is “A Christmas Story” but we also love the Grinch, Charlie Brown Christmas, and Muppet Christmas Carol. – Take out by candle light. I like allot of the suggestions you have for your kids too, I wrote them down for our advent calendar this year. I really love this advent idea too. But in theory only. I can’t imagine doing one of these every single evening — you know, exhausted after a full day and through the 16-month-old’s ‘witching hour.’ You’re a stronger woman than me, Ms. Turtlehead! Maybe I’ll try for one a week? I may do this next December if I am not working yet. I am still not sure when I will go back to work. I love the idea, but find it overwhelming with my full time work schedule. I love this idea. Maybe I’ll actually get around to trying it this year! I automatically thought of the Star Wars Christmas special when I read #14 too. I agree with DaniGirl – it’s just dreadful. But it’s something you need to watch at least once. This is so cute! I hope you have fun this year. My two favorite Christmas movies are A Muppet Family Christmas (the one where they all go to Fozzie’s mom’s house), and the original version of Miracle on 34th Street. Fabulous idea. I saw this on Andrea’s blog too and really want to get organized and do it this year. It is nice to see someone else who put it into action . . . I think my kids would really get a huge kick out of it and it would put some “FUN” into a sometimes stressful and awfully busy holiday month. We did this last year too. It was so much fun. My girls loved it. Our Christmas movie of choice is The Polar Express.